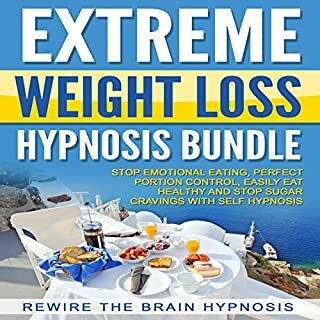 The audiobook contains: emotional eating hypnosis, which subliminally instructs your mind to avoid eating too much; stop sugar cravings hypnosis, to help you cut back on sugary foods. 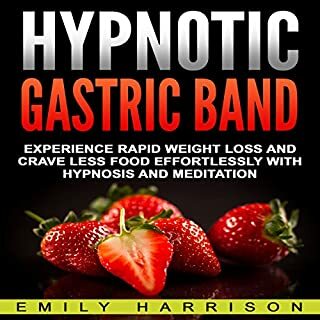 This book also includes affirmations on losing weight, eating healthy food, and avoiding overeating, which you can listen to as you sleep. When you repeat these affirmations daily, they will become a normal part of yourself, an almost indistinguishable facet of your personality. Helped me recover from an eating disorder. Discover the Freedom of Not Being Controlled by Food! Are you feeling frustrated with your lack of results? Tired of the emotional, weight-loss roller-coaster ride? Do you wonder if you’ll ever reach your goal weight, even after having weight-loss surgery? Throughout this audiobook, you will be guided from start to finish. We will begin with your current state of dissatisfaction with your current lifestyle and bring you to a relaxed state of calm awareness, where you will be able to push all of your unhealthy cravings into the distance and find peace within the positive affirmations for losing weight. 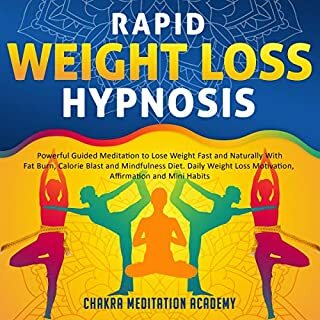 This hypnosis and meditation guide is designed specifically for those who want to rapidly lose weight in a healthy way while increasing your motivation for achieving your ideal body. 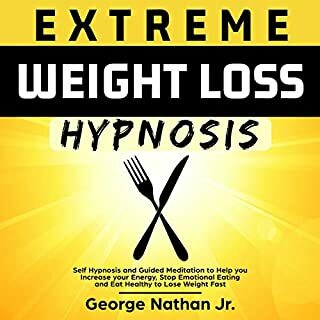 Discover The Power of Hypnosis for Losing Weight Fast and Increasing Your Motivation to Lose Weight via Hypnosis and Meditation! Do you wish you could deeply relax your body and mind and completely let go of your tension and stress? 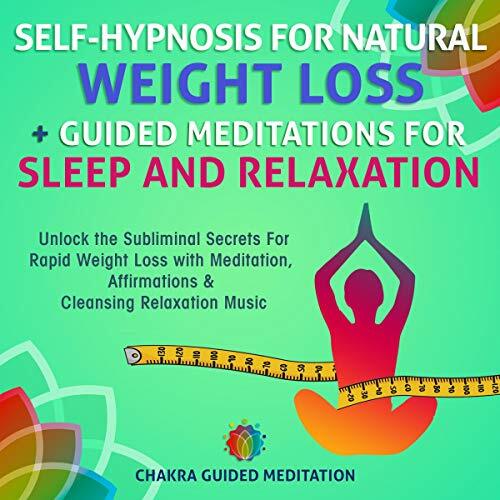 Melt away worry, create stress relief and calm, and deeply relax both your body and mind immediately with this hypnosis book from Chakra Guided Meditation. You will be amazed just how effective breathing meditation can be at helping you destress, calm the mind, and increase positive emotions! I'm enjoying this audiobook and the process of getting slimmer. It's not an easy journey, but I'm excited about the future. This audio makes the process easier. This meditation for me has removed much self doubt and negative self talk. Removes stinking thinking. I usually put on her immune tape first. Then when I wake up in the middle of the night, I'll play the weight loss affirmation. When I play this tape daily, I eat less junk, I workout more and I'm more motivated to stay on the right track. Losing weight and getting in shape is consistent behavior over time. Puts me to sleep half way through but then wakes me up at the end with someone else talking about the author and audible. It seems like I was falling asleep every time at the same spot so I had to try to stay awake to listen to the whole thing to hear what I was listening too. Very peaceful music! I have been listening to this for several nights now and notice my eating habits have changed. No more hitting the vending machines at work. I love this program, it's got the right messages for getting you into the right mindset for losing weight and making fitness a lifestyle. I would be better off sitting in my own yard, with my own thoughts. Does nothing on guided meditation. This has been useful for me so far, as I've been shifting my thoughts towards eating healthier food and exercising more, and just making better decisions for myself. 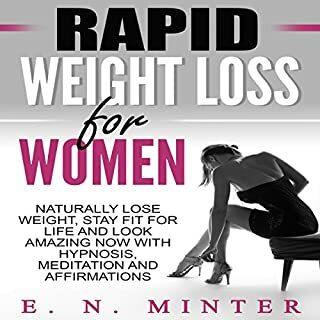 This weight loss audiobook is like a jump starter for weight loss. Love the motivation it brings and I feel it can last as long as you listen whenever you feel you are losing the will to continue on a healthier path. It's worth it to at least try in my opinion. I like how this is structured and found it helpful for me in the way it helps frame healthy eating and staying in the zone. I found this to be very effective at getting me to crave healthier foods and actually want to work out my abs, which used to be my least favorite exercise. Now, I have healthier eating and exercise habits with ease, which is a big change for me. I love anything and everything positive. I listen as often as I can throughout the day. I like this for how it changes your mentality and attitude, helping you reach your weight loss goals faster and more efficiently. Great motivational tool and way to stay on track long term. I wish it were 3 times longer than it is. It would take me until the 2nd count down to knock me out, but when it did, I think it was the best sleep I've gotten in a while. I also believe the hypnosis works as well, as I was skeptical at first. My cravings for food have changed. I've been listening to this book once a day. I do find myself effortlessly making healthier food choices, and I don't seem to feel the urge to keep eating when I know I'm full. I like this for everyday use to get a mindset about weight loss that feels natural. My usual thought process about food isn't so much healthy as it is for pleasure... not so great for the waistline. Sticking to my diet has become easier with this audio by my side. It's a soothing way to fall into a natural suggestive state that helps you ingest messages that help you in the long run for staying on track with your diet and essentially losing weight. It's a good way to stay on target with weight loss goals and make sure your mentality matches your goals. The two things you need to do to lose weight are to eat healthily and to exercise regularly. However if you have any energy blocks preventing your from doing either of those two things, weight loss can be an ongoing battle. Repetitive behavioural patterns that you find it hard to shake are often caused by blocks in your energy fields. By healing yourself emotionally and clearing your energy body of imprints from the past you can release patterns that have been with you for a long time. I feel so relaxed. 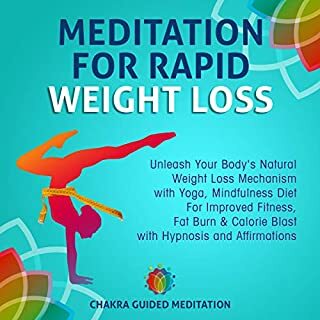 Best of all the author explained things so clearly and simply that I am understanding much more simply how the body and Meditation for Weight Loss works and what I can do to have my body run better. Thank you. There were too many times I would wake up to hear ocean sound effects...too many gaps of no subliminal messages. Too many times with the sound of the ocean that I had to get up to go to the restroom! I've listened to this audio several days...In fairness I will complete the 2 weeks days of listening while I sleep.... but so far it's a bit disappointing. What tells this book apart, that it brings you back to some time in childhood to discover things that prompt one to compensate with eating, etc. It goes beyond just repetitions and suggesting not to pig out ;). As I said, I bought a bunch, but this is my favourite one, and the one that works the best. His voice is very calming and relaxing. I drifted off into a deep state of relaxation. I will listen to this again and again. I will watch for positive change and results. My only suggestions is that at the very end of it, I felt like he should have said something to conclude it; such as "you may wake up now". Overall, loved it! I found myself making better choices each day without even thinking about it. Feeling so much better!